This great week of events is back – Lake Tahoe Marathon September 27-29, 2013! 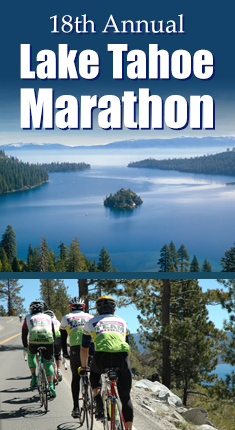 That’s right, the 18th annual Lake Tahoe Marathon weekend has an event for everyone! Whether you are a runner, swimmer, biker, or you are more comfortable walking or paddling, (or even playing speed golf! ), you should check out the list of 30+ events and find the one that’s right for you. There will be three marathons and three half-marathons, plus some triples and doubles, a 20-miler, Kids Fun Runs and so much more. Based on feedback from last year’s event, there have been quite a few changes and improvements to the 2013 event. The 50-miler has been replaced by a new Double Down Marathon, and a 10K was added to the 3-day Triathlon. If running uphill isn’t your thing, sign up for the All Down Hill Tahoe 10K, which is 99% downhill. Competitors of all ages are welcome, from toddlers all the way up to octogenarians. The events are held at various locations around Lake Tahoe, including Commons Beach in Tahoe City, CA, Pope Beach, and Emerald Bay.